So far this week, all my posts have been fairly short. I think I'll somewhat stick to that vein today since I want more time at the craft desk and not the computer desk. 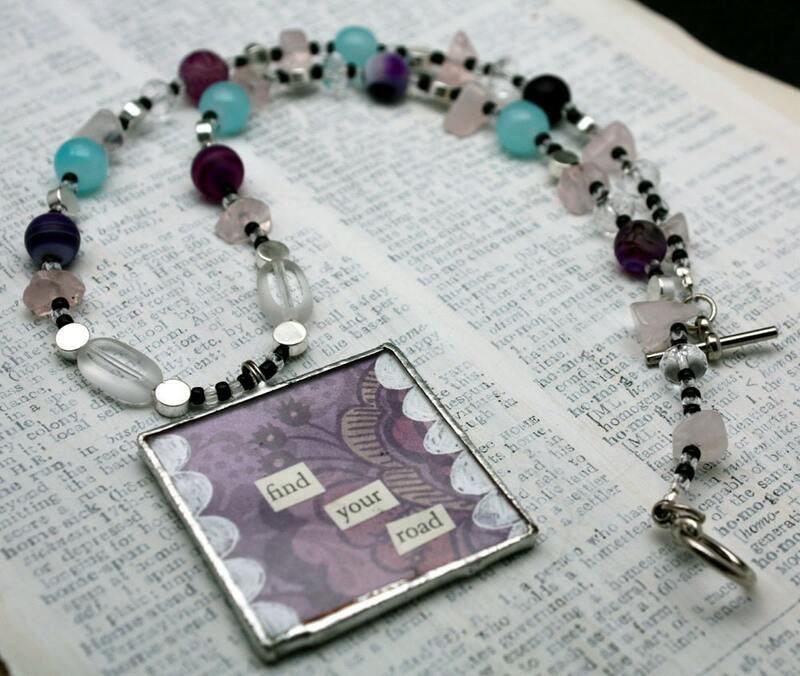 This works out as it it Bead Table Wednesday. I'm a collector of found objects and my eyes are constantly scanning the ground for treasures. I'm also a beach-loving, sand-in-my-toes, salt-in-my-veins, sun-on-my-skin kind of girl. As such, I've got bags and bags and bags of shells stashed away in the craft room. While I could have pulled out any of those, I decided to work exclusively with the baggie of shells I found over the weekend. As a collector, I've got piles of all kinds of objects. 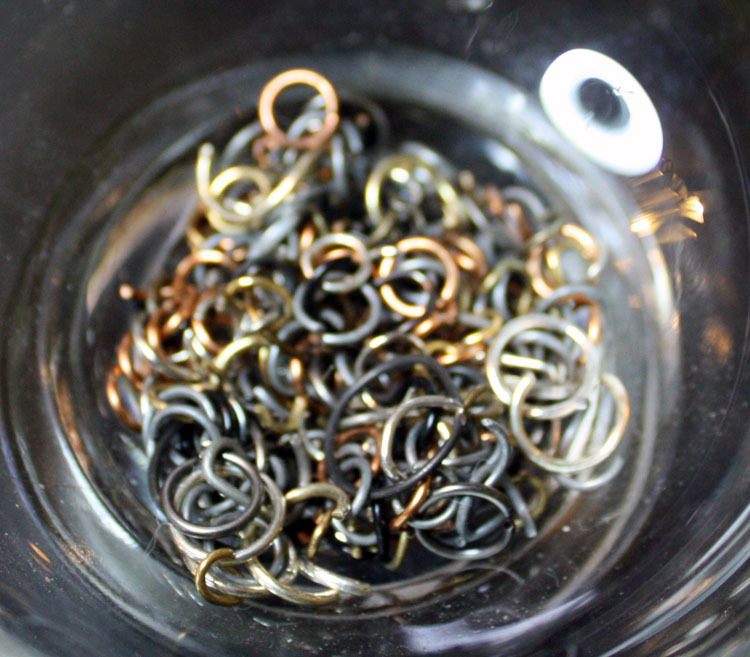 Above is a small bowl of jump rings in mixed metals. When I find that I've got an extra one or two still out from a project, I tend to just throw them in this bowl that's close at hand. 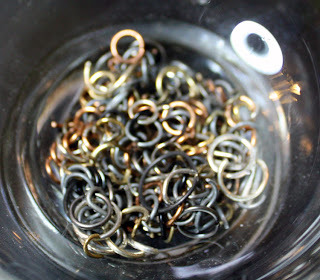 It works out well when I just need one jump ring for something or when I'm trying to clean my desk and find stray jump rings under all the mess. All these above items are piled on my craft desk at the moment. I think they're working well together, playing nicely if you will. I guess I'll see in the end! Now, back to those collected piles to see what emerges! What's on your craft desk today? Love the shells on your table. You are so right collect the ones with the holes less work. I have little baggies of mix matched beads and odd findings one day I will put them all together in a piece of bead work. I have the soup for a challenge, and tons of supplies. My bead table is actually quite clean at the moment. I have spent some time on your blog. It is very nice and I have enjoyed getting to know you a bit. I like what you have done with the shells. 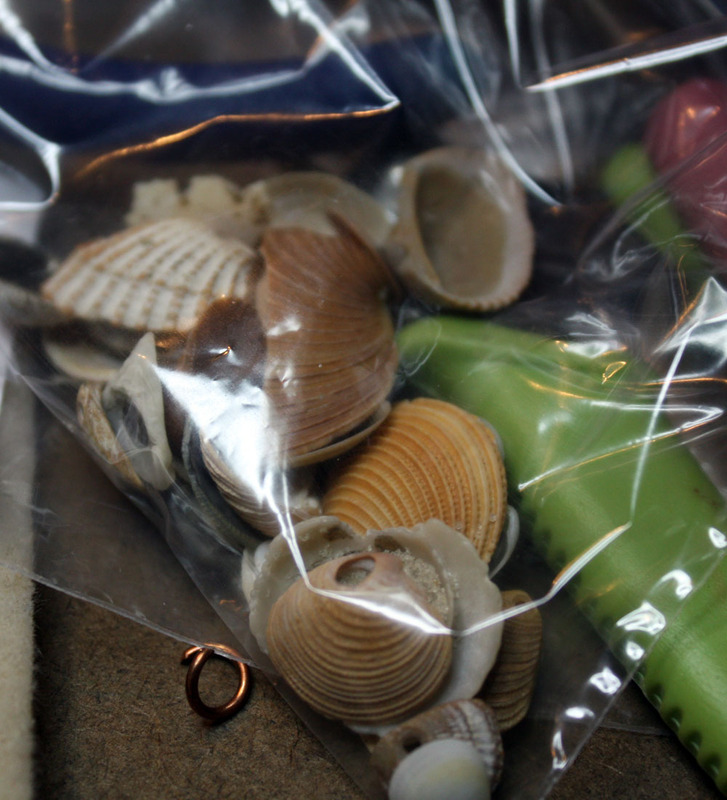 I also have a ton of shells from my walks on the beach. I need to get them out and make something. Mary- I'm so pleased that you like my little pile of shells. 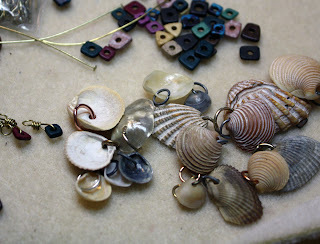 Wait until you see what I did do with them. . .it's a secret for now (Bead soup and all ;) ) I'm glad to know I'm not the only beader with stashes of shells. I look forward to seeing what you come up with! Cindy- First off. I live on the Alabama Gulf Coast (Gulf Shores, Orange Beach, Fort Morgan) and the shell finds vary all the time, but I don't usually have too big of a problem finding shells when I want to. It's a shame that you do though. My jump ring bowl is probably more out of laziness than anything. Sometimes it's just such a pain to find the exact container a single jump ring needs to go back into after a project. Instead, I just toss them in a bowl. I do the same with leftover beads. While it is lazy, it's quite helpful for me trying to clean up. Thanks for the interest, I appreciate it!